"Ocean Beach, California" redirects here. For the beach in San Francisco, see Ocean Beach, San Francisco. Ocean Beach (also known as O.B.) is a beachfront neighborhood of San Diego, California. Ocean Beach lies on the Pacific Ocean at the estuary of the San Diego River, at the western terminus of Interstate 8. Located about 7 miles (11 km) northwest of Downtown San Diego, it sits south of Mission Bay and Mission Beach and directly north of Point Loma. The O.B. 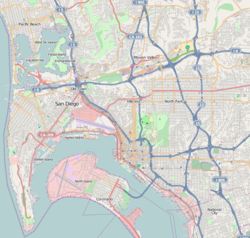 community planning area comprises about 1 square mile (742 acres), bounded on the north by the San Diego River, on the west by the Pacific Ocean, on the east by Froude St., Seaside St. and West Point Loma Boulevard, and on the south by Adair Street. The beach's initial name was Mussel Beach, for the mussels available there. Its current name, Ocean Beach, was given in 1887 by developers Billy Carlson and Albert E. Higgins. The pair built the Cliff House, a resort hotel, and subdivided the area into lots. To promote their subdivision, Carlson and Higgins organized various activities, including mussel roasts and concerts. Despite their efforts, the development did not do well, because it was two and a half hours by carriage from downtown San Diego. They rented a locomotive, but by that time, the boom ended and the development was put on hold. The Ocean Beach Railroad, launched in April 1888, was a casualty of the economic decline. Passengers could take a ferry from San Diego to Roseville in Point Loma to ride the train to the Cliff House. Later, Higgins committed suicide, and a fire started by a fallen chandelier burnt down the Cliff House in 1898. Carlson sold the Ocean Beach tract to an Eastern financier, delaying its development for 20 years. Carlson and Higgins were not the first to file a subdivision map in Ocean Beach. They filed with the city on May 28, 1887, but on April 22 of that year J.M. DePuy filed "DePuy's Subdivision" on 15 blocks in the northern portion of O.B. One of the earliest residents of Ocean Beach was D. C. Collier, who bought oceanfront property there in 1887 when he was just 16. He later became one of the "fathers" of Ocean Beach, laying out streets, promoting sales, and building the Point Loma Railroad in 1909 to connect Ocean Beach with the rest of San Diego. By 1910 there were 100 houses in Ocean Beach, compared to just 18 two years earlier. According to historian Ruth Held, Collier's rail line "made OB possible." He also built Ocean Beach Elementary School (a two-room school) and donated park land to the city. Most of that land became Cleator Community Park (a ballfield), Correia Middle School (originally named Collier Junior High School), a YMCA and a church; a small remnant at Greene and Soto streets is still called Collier Park. The northern end of Ocean Beach was dominated in the early 20th century by the Wonderland Amusement Park, which opened on July 4, 1913 and was constructed on eight oceanfront acres at Voltaire and Abbott streets. It boasted a large roller coaster, dance pavilion, menagerie, roller skating rink, merry-go-round, children's playground, a petting zoo with a variety of animals including 500 monkeys, and 22,000 lights outlining the buildings. However, Wonderland went bankrupt in 1915 due to competition from the Panama-California Exposition in Balboa Park and was sold at auction. It closed in 1916 after winter storms damaged the roller coaster. The name "Wonderland" lives on in some Ocean Beach business names as well as the title of a documentary series on KPBS television hosted by Ocean Beach native Noah Tafolla. In 1915, John D. Spreckels and his Bayshore Railway Company built a 1,500 feet (460 m) wooden bridge connecting Ocean Beach with Mission Beach. The company used the bridge for a trolley, part of the San Diego Class 1 Streetcars, which connected OB with Downtown San Diego and encouraged the development of both Ocean Beach and Mission Beach. The bridge was demolished in January 1951, thereby cutting off through traffic to Ocean Beach from the Mission Beach and Pacific Beach communities. The small cottages, bungalows, single-family homes and two-storied apartments in the residential areas, were filled with college students from several local colleges, joined by a good number of sailors, retirees and middle-class families. Some of the bungalows built as tourist accommodations atop the cliffs on either side of Niagara Avenue are still in use as businesses and homes. With the dredging and development of Mission Bay and the dismantling of the Ocean Beach-Mission Beach bridge, O.B. became geographically isolated from the rest of San Diego and the other beach communities, until the construction of Interstate 8 in 1967. The westernmost segment of I-8 from Interstate 5 to the terminus in Ocean Beach is officially labeled the "Ocean Beach Freeway". Surfing was introduced to San Diego at Ocean Beach in 1916 when a local lifeguard borrowed a board from Duke Kahanamoku (although it's possible that George Freeth surfed there between 1907 and 1909). By 1966, the sport was sufficiently established that the World Surfing Championship was held in O.B. Nat Young won the event and was named world surfing champion. Ocean Beach was once known as the Haight-Ashbury of San Diego. The community became an attraction for hippies, who eventually became accepted by many local business establishments. The Black headshop opened on Newport Avenue, as well as the Ocean Beach People's Organic Food Market. Beginning in the early 1970s, local development and land interests pressed for the development of Ocean Beach's oceanfront, with plans for tourist-oriented resorts, hotels and a marina outlined in the Ocean Beach Precise Plan. With the passage of a 30-foot (9.1 m) height limit in 1972 and the re-writing of the Precise Plan, the development plans for the waterfront were abandoned. Ocean Beach contains the Ocean Beach Cottage Emerging Historic District consisting of various Craftsman bungalows, cottages and other structures built from 1887–1931. There are a number of other individual San Diego Historic Landmarks in Ocean Beach. Designated city historic landmark buildings are the Ocean Beach Library and Strand Theater. The economy of Ocean Beach is dominated by small, independent retail businesses. Newport Avenue, the main business street, featured family-owned businesses from the 1930s through the 1960s, such as a bakery, drug stores, a book and novelty shop, a shoe store, men's and women's apparel shops, and a family-owned pet store. In the 1960s and 1970s larger stores and shopping malls elsewhere in the city gradually ran the small local stores out of business. Many of the storefronts were then turned into antique stores, and the area is now known as the Ocean Beach Antique District. Also on Newport are restaurants, head shops, tattoo and piercing shops, coffee houses, bars, bike and surf shops, and an international youth hostel. In 1969 Hodad's opened on Newport, gaining national attention in 2007 after appearing on Diners, Drive-Ins and Dives. There are several small independent hotels in O.B., but no nationally franchised hotels. The community has actively opposed chain businesses opening in Ocean Beach, and only a few exist there. In the 1970s, community protests led a chain of donut stores to drop its plans to open a store in O.B. In 2000 an Exxon station abandoned its attempt to open a gas station there. In 2001, an organized grassroots effort attempted unsuccessfully to block Starbucks from opening a coffee shop in Ocean Beach. Ocean Beach is the site of a historic single-screen movie house; The Strand Theatre, which opened in November 1925. In the late 1970s, the Strand survived with midnight showings of The Rocky Horror Picture Show on Friday and Saturday nights. By the early 1980s it was running pornographic films. Community reaction forced it to change back to regular films. It closed in the 1990s and was converted into a clothing store after several failed attempts to preserve it as a theater. The theater was designated a historic building by the San Diego Historical Resources Board in December 2002. Residents of Ocean Beach often refer to themselves as "OBceans" or "OBecians," which is pronounced "oh-BEE-shun" (although the proper spelling is a matter of dispute). Ocean Beach has two schools: Ocean Beach Elementary (a K-4 public school) and Warren-Walker (a K-8 private school). The community also features multiple churches, a public library, a U.S. post office, and a vegetarian food co-op. Recreational facilities include the Ocean Beach Recreation Center, Dusty Rhodes Park, and the Robb Field athletic fields and skate park. Local organizations include the Ocean Beach Town Council, the Ocean Beach Mainstreet Association, a Kiwanis club, and the Ocean Beach Historical Society. The Ocean Beach Planning Board advises the city regarding growth and development. Local events include the Ocean Beach Street Fair and Chili Cookoff in late June, a jazz festival at the foot of Newport in late September, the Ocean Beach Christmas Parade in early December, the Ocean Beach Kite Festival on the third Saturday of May, and the Ocean Beach Canine Carnival on the third Saturday in October. On Wednesday afternoons two blocks of Newport Avenue are closed for a farmers' market. The 1,971-foot (601 m) Ocean Beach Municipal Pier, built in 1966, is the longest concrete pier in the world and the second longest ocean pier in California. The pier supports a restaurant and bait shop (Ocean Beach Pier Cafe), which is located about 200yd/.03m down the pier. It is open 24 hours a day. A concrete walkway spans part of the length of the 1 mile (1.6 km) beach. The northern end of O.B. 's waterfront is known as Dog Beach. It's open 24 hours a day for leash-free dogs and was one of the first such beaches in the United States (founded in 1972). Ocean Beach and adjacent Point Loma are home to a sizable population of feral parrots and their offspring, known locally as the "O.B. air force." The sub-tropical climate is nearly ideal for parrots. The parrots, mostly Amazons, are most active and vocal at sunrise and sunset. ^ "Ocean Beach, CA". Ocean Beach Planning Board. Archived from the original on 20 June 2013. Retrieved 15 August 2012. ^ "Ocean Beach Community Profile". City of San Diego. Retrieved August 15, 2012. ^ Engstrand, Iris (2005). San Diego: California's Cornerstone. Sunbelt Publications. p. 106. ISBN 978-0-932653-72-7. ^ Erwin G. Gudde (10 May 2004). California Place Names: The Origin and Etymology of Current Geographical Names. University of California Press. p. 267. ISBN 978-0-520-24217-3. Retrieved 15 August 2012. ^ Herbert Lockwood (1 September 2003). San Diego's Hysterical History: Fallout from the Skeleton's Closet. Coda Publications. pp. 67ff. ISBN 978-0-910390-67-5. Retrieved 15 August 2012. ^ Rhoda E. Kruse (Fall 1977). "Mystery Man of Ocean Beach". The Journal of San Diego History. 23 (4). Archived from the original on 2012-07-20. Retrieved August 15, 2012. ^ a b Gormlie, Frank (September 20, 2012). "Part Four in Quest for OB's True Birthday and Founder". OB Rag. Retrieved 29 November 2012. ^ Richard Crawford (May 10, 2008). "Ocean Beach had its own amusement park long ago" (PDF). San Diego Union-Tribune. Retrieved August 15, 2012. ^ Gentile, Anthony (2010). "OB's Noah Tafolla living in television 'Wonderland'". SD News. Retrieved 15 August 2012. ^ Terry Curren; Phil Prather (17 October 2007). Mission Beach. Arcadia Publishing. p. 7. ISBN 978-0-7385-4785-5. Retrieved 15 August 2012. ^ Zelma Bays Locker (Spring 1975). "From Aspin to Zanzibar: Street Names in San Diego's Mission Beach". Journal of San Diego History. 21 (2). Retrieved August 15, 2012. ^ Matt Warshaw (7 November 2005). The Encyclopedia of Surfing. Houghton Mifflin Harcourt. p. 519. ISBN 978-0-15-603251-3. Retrieved 15 August 2012. ^ The Editors of Surfer Magazine (4 May 2006). Surfer Magazine's Guide to Southern California Surf Spots: Santa Barbara - Ventura - Los Angeles - Orange - San Diego. Chronicle Books. p. 158. ISBN 978-0-8118-5000-1. Retrieved 15 August 2012. ^ a b Irene Lechowitzky (June 15, 2008). "Flip-flops and co-ops". Los Angeles Times. Retrieved August 15, 2008. ^ Orlovsky, Christina; Blair, Graham; Radack, Lauren (March 2006). "The Best Places to Live (In San Diego)". San Diego Magazine. Retrieved 8 February 2015. ^ "No sign of foul play in Hodad's owner's death". KGTV. San Diego. 6 February 2015. Retrieved 8 February 2015. Jane Stern; Michael Stern (4 June 2009). 500 Things to Eat Before It's Too Late: and the Very Best Places to Eat Them. Houghton Mifflin Harcourt. pp. 331–332. ISBN 978-0-547-41644-1. George Motz (2011). Hamburger America: Completely Revised and Updated Edition: A State-by-State Guide to 150 Great Burger Joints. Running Press. pp. 21–23. ISBN 0-7624-4234-4. Matthew T. Hall (6 February 2015). "Hodad's Mike Hardin's death stings hard, spurs tributes". San Diego Union Tribune. Retrieved 15 July 2016. Debbie Hatch (5 August 2010). "Hodad's to open downtown". San Diego Community Newspaper Group. Retrieved 8 February 2015. Thom Patterson (16 April 2009). "Five tasty burger joints worth visiting". CNN. Retrieved 8 February 2015. "THE 100 GREATEST CULT RESTAURANTS IN AMERICA: 21-50". Poor Taste Magazine. 1 November 2010. Archived from the original on 8 February 2015. Retrieved 8 February 2015. ^ "Starbucks Not Welcome In Ocean Beach". Independent Business. May 1, 2001. Archived from the original on 2016-01-08. Retrieved August 15, 2012. ^ Ernie Grimm (September 27, 2007). "Community Coffee". San Diego Reader. Retrieved August 15, 2012. ^ Frank Gormlie (July 26, 2012). "Brief History of OB Grassroots Activism – Part 2". OB Rag. Retrieved August 15, 2012. ^ "Strand Theater". Cinema Treasures. Retrieved August 15, 2012. ^ "Historical Landmarks Designated by the SD Historical Resources Board" (PDF). SDHRB. Retrieved August 15, 2012. ^ Frank Gormlie (December 15, 2011). ""OBcean" is the word". OB Rag. Retrieved August 15, 2012. ^ "Farmers Market WEDNESDAYS". Ocean Beach Main Street Association. Retrieved August 15, 2012. ^ Garrick, David (March 7, 2019). "$430,000 set to repair damage to pier in OB". San Diego Union Tribune. ^ "California Piers and Wharves - Length in Feet". Vaughan's Summaries. Retrieved August 15, 2012. ^ "The Original Dog Beach". originaldogbeachsandiego.com. Archived from the original on May 30, 2012. Retrieved August 15, 2012. ^ "Wild parrots tame the concrete jungle". cityparrots.org. May 18, 2007. Retrieved August 15, 2012. Wikivoyage has a travel guide for Point Loma & Ocean Beach. Wikimedia Commons has media related to Ocean Beach, San Diego. This page was last edited on 13 March 2019, at 03:13 (UTC).